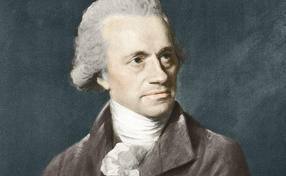 J. F. W. Herschel was the only child of the famous astronomer, Sir William Herschel (1738-1822). Born on March 7, 1792, he was raised in affluence and received a superior education, graduating first in his class at Cambridge. Herschel's far-reaching interests and abilities led him to make contributions in a variety of fields, including astronomy, chemistry, and photography. Celebrated during his lifetime, Herschel was a member of the premier scientific societies of his day and was knighted in 1831. After flirting with careers in chemistry and law, Herschel in 1816 turned to astronomy. Eventually he assisted his father in making astronomical observations and constructing telescopes. He also published papers on mathematics as well as physical and geometrical optics. Continuing their work after his father's death, Herschel observed nebulae, star clusters, and double stars in the northern hemisphere, compiling and publishing an extensive catalog that included many new sightings. From 1834 to 1838 he made detailed astronomical observations in the southern hemisphere from his base at the Cape of Good Hope in southern Africa. Herschel used his invention, the astrometer, to gauge the brightness of stars. He also developed scientific meteorology locally and used a camera lucida to make pictures of flowers and scenery. Upon his return to England, Herschel analyzed his latest astronomical data and conducted photographic research, which together occupied much of his time until the mid-1840s. After learning from a note of Louis-Jacques- Mandé Daguerre's photographic discoveries in France in 1839, Herschel produced his first successful photograph on glass within a week. He then made improvements to the process as he knew it, the most famous of which was the use of sodium thiosulfate, or hypo, to fix photographs. He first used gallic acid in photography, a chemical indispensable for printing photographs on paper, and is also credited with introducing the terms "positive" and "negative" into photographic vocabulary. Herschel was more interested in theory than practice and did not seek fame as did other photographic researchers. In all, Herschel published a flurry of eleven papers describing the many chemicals and photographic processes he researched, among them the procedure for making direct positives on paper; the process used to make positive prints from glass negatives; his discovery that bromide of silver was more light-sensitive than any other silver salt; and the possibility of natural color photography. Herschel spent his last years preparing his astronomical observations of the southern hemisphere. In 1849, he published the highly successful Outlines of AstronomyAstronomy, which solidified his reputation as a premier astronomer of his day. Herschel also wrote articles for the Encyclopedia Britannica and translated works of classic writers. In 1850 he became master of the mint. Upon his death on May 11, 1871, Herschel was buried in Westminster Abbey near Sir Isaac Newton.